All our breeding dogs are undergoing DNA testing for this fatal disease. Do not buy puppies unless parents have been tested. We have not produced any litters with this terrible genetic disease. There have been several litters born in WA, over east and overseas. Reputable registered breeders will publish the JLPP genetic status of each of their breeding stock. Our breeding stock are DNA tested "Clear" of JLPP Genetic Mutation, Certifications are displayed. 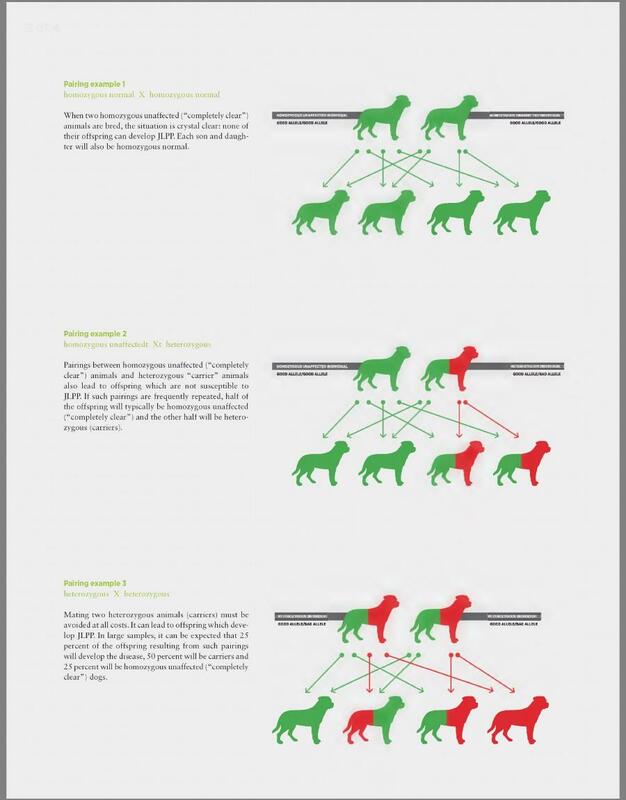 Breeding of DNA Clear to Clear OR Clear to Carrier will produce healthy puppies. Only puppies sold on to show homes for potential breeding require testing by the breeder. Attempting to "eliminate" the gene from breeding lines is short sighted and erroneous. Many great German Champions with highly desirable traits are carriers & to eliminate them from breeding programs is ridiculous. 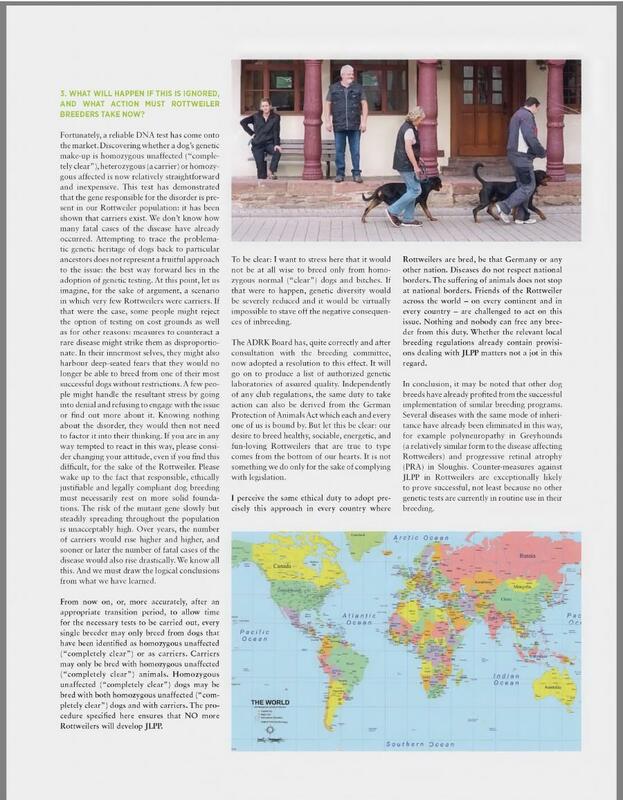 To eliminate carriers is not recommended by scientists or the ADRK Germany. Educated and sensible breeding according to genomic testing is the best way forward for the breed. Do not buy puppies from unregistered backyard breeders, their dogs have not been stringently health tested or DNA profiled for JLPP. This means you could be buying an affected puppy that will be euthanised at a later date & you may not have recourse to recover financial losses. This dog has tested normal (or clear) for the mutation known to cause JLPP. It can only transmit a normal gene to offspring, and can be bred to a dog with any test result without risk of producing affected offspring. This dog has tested as a carrier for the mutation known to cause JLPP. 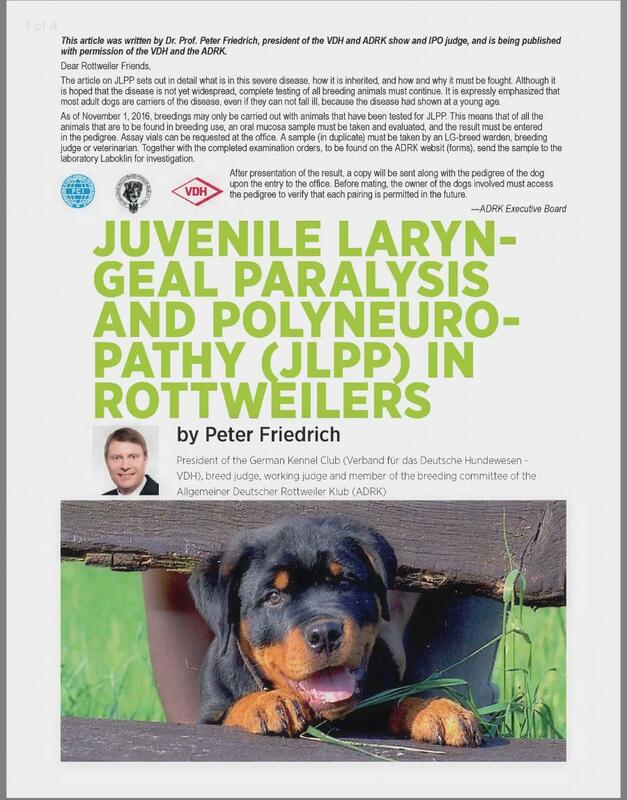 There is no evidence at present that these dogs will develop clinical symptoms of JLPP. It may transmit either a normal gene or a mutated gene to potential offspring. This dog has tested as affected for the mutation known to cause JLPP. It is at risk for developing clinical symptoms of JLPP, which generally begin to appear at about 3 months of age. The clinical signs include difficulty breathing, change in bark, weakness and loss of coordination, and difficulty swallowing which can result in choking or pneumonia. There is no effective treatment for this condition, and even with supportive nursing care, these dogs do not live more than a few months after clinical signs begin. Because of the possibility of new mutations or as of yet undiscovered gene mutations, only first generation offspring will be cleared with a certificate of clear by DNA. 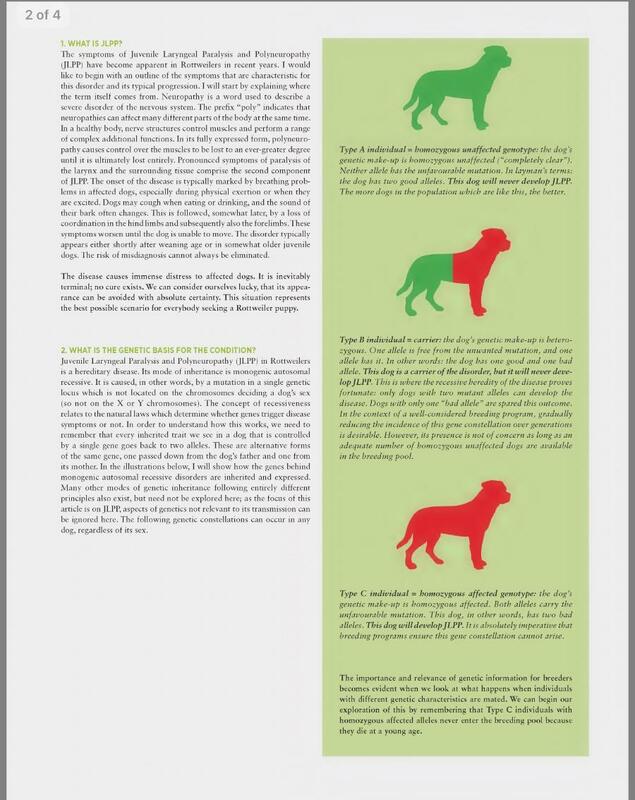 For linkage or marker based tests where a margin of error including both false positives and negatives exists, the OFA will not issue any clearances to untested dogs. DNA based disease screening is an evolving area (OFA, USA 2017).